California dreaming, for me, includes amusement parks, and driving up the Pacific Coast. In all the years of dreaming about my trips to California, It’s never been about museums, or visiting historical ships! After my most recent jaunt across the U.S.A. to visit the West Coast, Long Beach has sky rocketed to a MUST-DO in my California travel plans every year. It’s super close to Los Angeles, yet, you’d never know it! Find out what Long Beach has in store for the dreamers…. First, let’s hit on the weather in Long Beach. It has to be addressed for packing purposes, am I right? If you’ve ever been to California, you know many areas can get a bit…. hot. Long Beach in August has the perfect weather, thanks to the ocean breezes! Shorts, sundresses, your favorite bathing suit, and loose clothing, is optional. However, in the evenings, it can get a bit chilly, so when preparing to pack for a long weekend in Long Beach, make sure to pack some long pants, and light sweaters. You’ll need them for beautiful gondola rides, walks along the beach, and if you can’t get a seat near one of the many outdoor heaters at your favorite dinner spots. With that out of the way, let’s get to know Long Beach! Let me take you through the perfect itinerary for a long weekend in this seaside community. When you arrive in Long Beach in the middle of the day, and you’ve checked into your hotel, taken your mini power nap, it’s time to get your evening started! What better way to get the long weekend started, than with a stop at Fuego Restaurant and Bar at Hotel Maya. If you’re hoping to enjoy amazing cocktails, and great treats like salsa, guacamole, and ceviches, you head to Fuego’s Restaurant and Bar at Hotel Maya’s. You don’t have to be a guest of the Hotel Maya in order to enjoy Fuego’s, but if you want to enjoy amazing views of Long Beach’s skyline, there’s no better place than Hotel Maya. 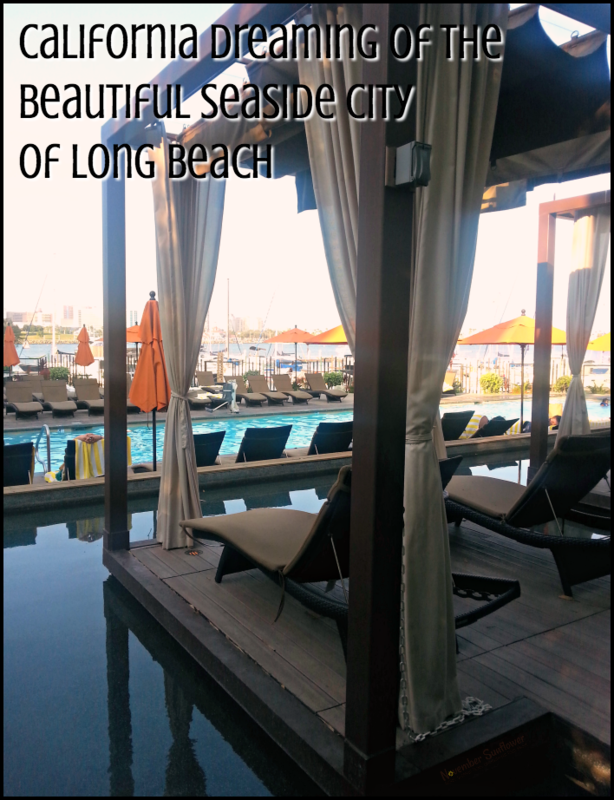 It’s the only hotel where you can enjoy an amazing view of Long Beach, while sitting poolside. It’s got the feel of Miami, and to make it as authentic as possible, imported sand from Miami for their beach areas. Hotel Maya has a beautiful pool, with floating cabanas, and fire pits. It’s a popular spot to relax, as well as play life sized chess games! Once a few light bites, and a few cocktails have made a home in your belly, the touring can start! 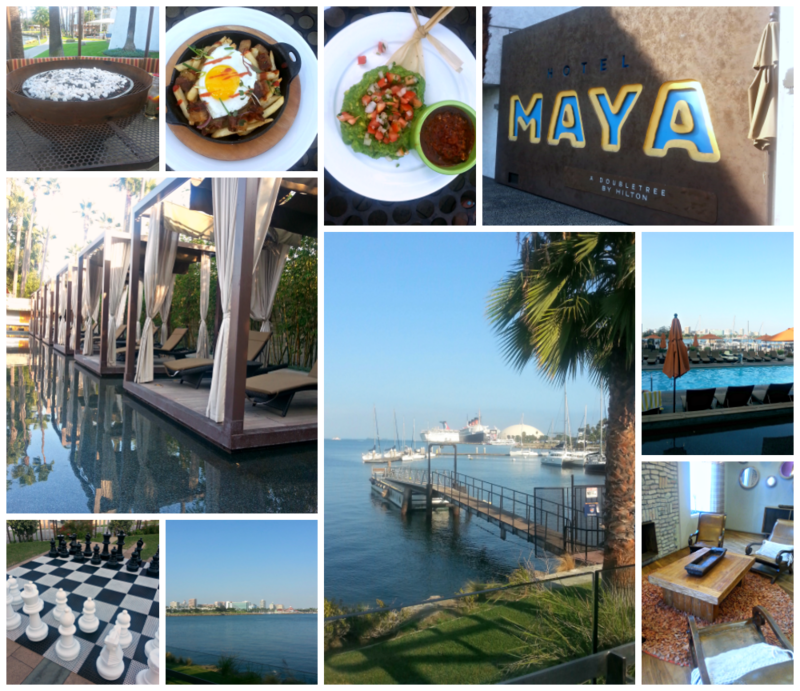 Maya Hotel is super close to the famous, the Legendary Queen Mary. 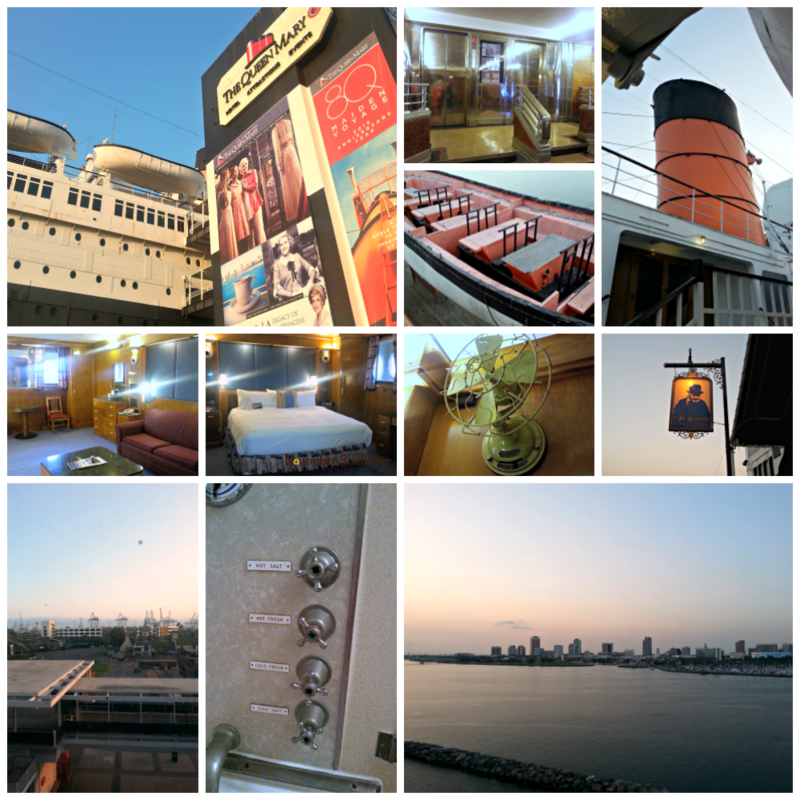 If you’re going to be in Long Beach, you have to check out the Queen Mary. It’s a piece of history you shouldn’t miss. Even if you’re not a huge fan of history, the beauty of this ship is a must see. Walking through the big ship transports you to a time when transatlantic voyages were the only way to travel. If you think the Titanic has a rich history, you’re in for some big surprises when you step aboard the Queen Mary. It’s bigger than the Titanic, and has far more to share! It made 1,001 transatlantic crossings throughout it’s years on the water, and you’ll have to visit and have a tour, to learn even more about it’s important role in history. You can stay on the boat, as it’s now a hotel, with amazing restaurants like Sir Winston’s. If you aren’t staying on the big boat, it’s okay. You can still enjoy a delicious steak, and tasty cocktails, at Sir Winston’s Restaurant & Lounge! Of course, you’ll have to reserve a spot for dinner at Sir Winston’s Restaurant & Lounge, and if you’re already taking a tour of the legendary ship, it’s just smart vacation planning to check out Sir Winston’s, right? Make sure, if this is the first visit you’ve ever had at Sir Winston’s, you ask for a table by a window! The views of Long Beach are gorgeous, and the way the skyline lights up as night sets in, and you dine on five-star food, is one of the most surreal experiences you’ll ever have. After a tour of the ship, as you sit and enjoy your dinner, you can’t help but think about the thousands of people who sailed on that same ship. The views weren’t the same, nor the food. However, the act of sitting with friends, or family, on the big boat, it gives history lovers goosebumps at the thought of it. Leaving to head back to your hotel can be difficult, but you’ve got to rest up for the rest of the weekend getaway. After a great night of sleep at Hyatt Centric, which is where I was lucky enough to lay my head each night, you’ve got to start off with more than just coffee for breakfast, am I right? 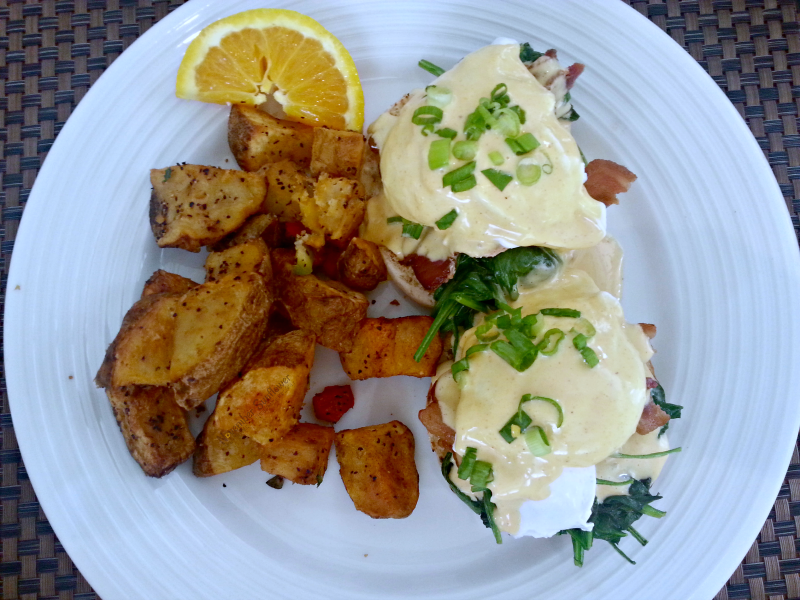 Every new day you need to fuel up for a long day of experiencing Long Beach, it’s fact, not fiction. If you’re staying at Hyatt Centric, you’re lucky enough to have easy access to a farm-to-table restaurant, Bay Street Kitchen. 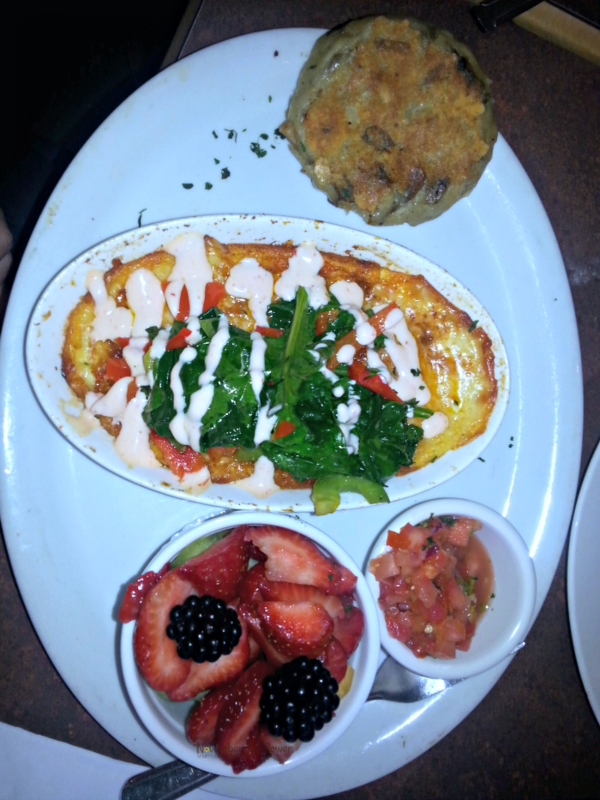 Seasonal ingredients are incorporated into not just the breakfast menu, but also their dinner menu. Rest easy, though. 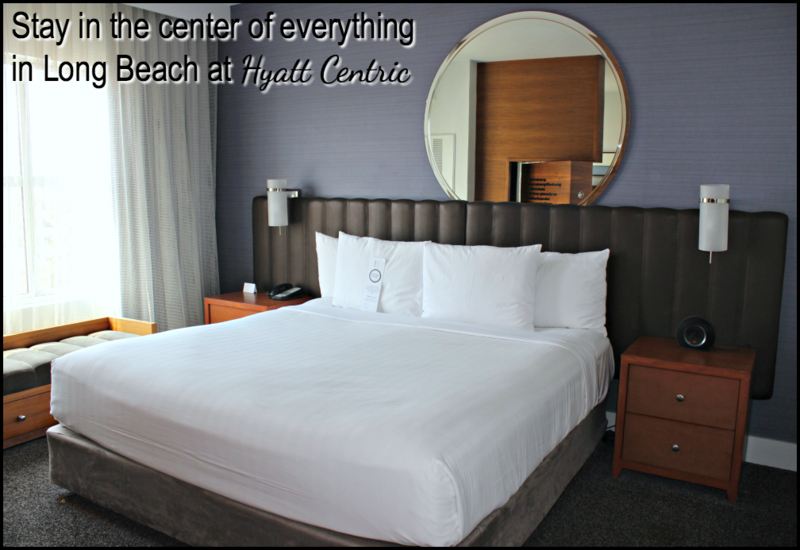 If you’re not a guest of the Hyatt Centric, you can still head to the Bay Street Kitchen, to enjoy breakfast, or dinner. Luckily, I experienced breakfast at Bay Street Kitchen, with house-made granola and a delicious smoothie to start the meal! Everything tasted fresh, and burst with flavor. I highly recommend the ordering breakfast that includes eggs, because those farm fresh eggs are divine. Be prepared, there’s a good amount of food served, no matter what you order! You’ll need it, though. Getting through a busy day of exploring Long Beach requires a big, healthy breakfast! Who can resist farm-to-table goodness, and seasonal ingredients? Not me! Once fueled up, museums are on the menu. I know what you’re thinking, “this girl went to Long Beach, and spent her morning at a museum? What?” Listen, it sounds nuts, but I have to tell you, the Long Beach Museum of Art, is a mandatory when in Long Beach. It’s small, quaint, and a great way to start your day. Especially when the Vitality & Verve: In the Third Dimension exhibit is happening. 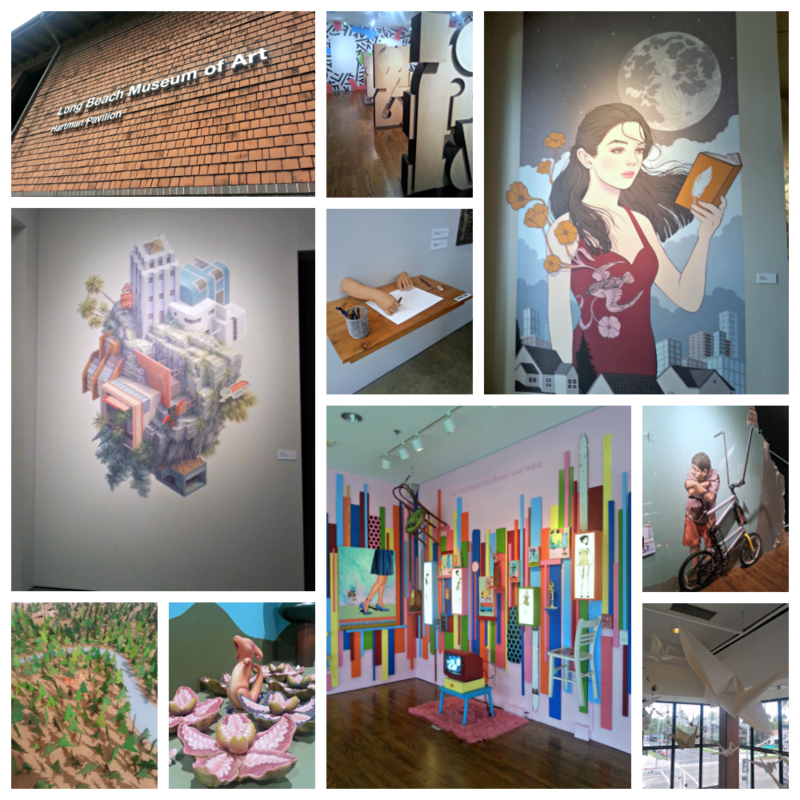 The museum features multi-media installations by nationally, and internationally renowned urban contemporary artists, ceramic artists, and sculptors. Get ready to immerse yourself in the worlds of these artists, and if you’re lucky enough, meet an Artist in Residence, like I did! One of the coolest exhibits was from Kiel Johnson, and being able to hear him speak about his art, and his process for creating his works of art…. you leave inspired to pull out a pad of paper, and some pencils, and just create art. However, I’m not great at drawing, so I went back to my room later that night, and wrote! Don’t think museum time is over, though. If you’re going to do it right, you’ve got to visit Museum of Latin American Art (MOLAA.) Seriously, if you’re going to take the plunge into the world of art, you’ve got to visit Museum of Latin American Art. It’s celebrating 20 years in existence, and after touring the entire facility, I think it’ll be around for many more years. 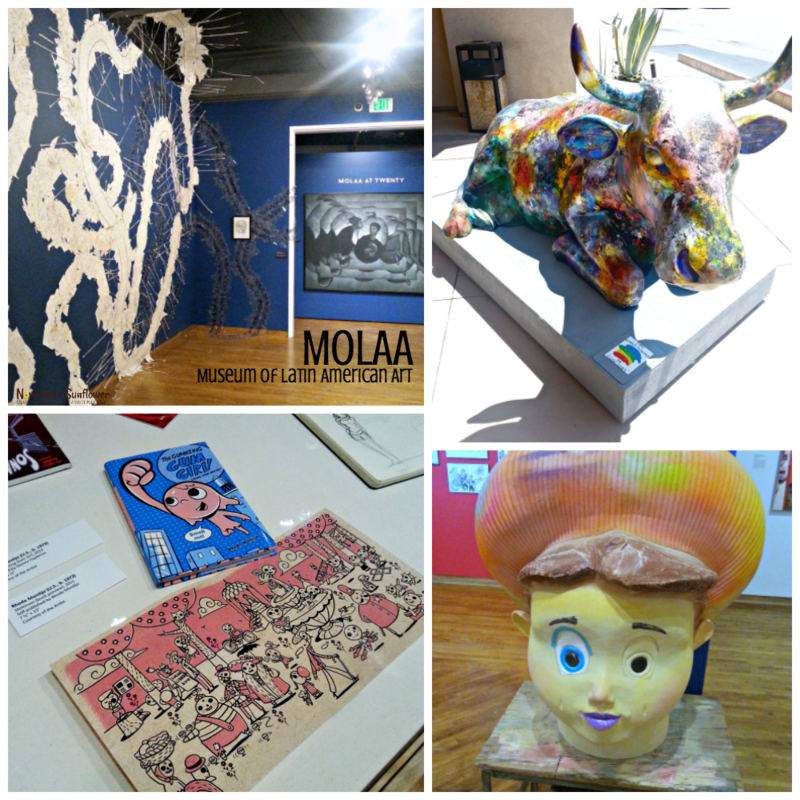 Luckily, not only did I get to see the MOLAA at Twenty: 1996-2016 exhibit, but also saw the Artists Assemble! Empowerment and Inspiration in Contemporary Comics. It’s amazing to see stories that have been excluded from mainstream comic book art. The artists tackled controversial socio-political issues, and current events, but also marginalized groups. All of the art was inspired by not just historically based mythologies, but also invented ones. Creativity exploded in that room, and the curators Esperanza Sanchez, and Naiela Santana, have created a space everyone needs to check out. I wish the exhibit was going to be around much longer, but it ends on September 18th of this year. If you’re visiting before the 18th, head over to MOLAA, you won’t regret it. After an amazing morning of art, the only way to start the afternoon is with a little stroll down Fourth Street Retro Row, for a bit of vintage shopping, before setting up shop at a local favorite, Lola’s Mexican Cuisine, for lunch. If you ask anyone who lives in Long Beach, they’ll tell you, when in Long Beach, eating authentic Mexican Cuisine is part of the ultimate seaside community experience. 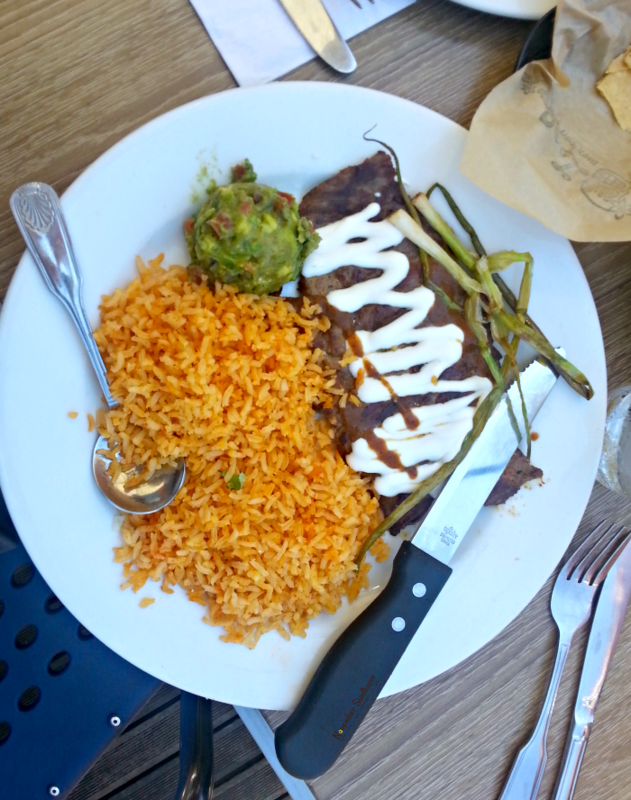 I happen to love Mexican Cuisine, and Lola’s Mexican Cuisine puts a fantastic unique spin on the typical menu offerings. What’s so unique about Lola’s? Beyond using farm-to-table ingredients, all the recipes are based on Lola’s grandmother’s recipes, handed down to Lola when she was just a little thing, probably younger than my Little Miss! Make sure to ask to sit on the patio fresco, because there’s nothing like enjoying spicy carne asada, Lola’s guacamole, and La Catrina cocktail, while people watching! What about the water? It’s Long Beach, when do we experience the water? Right about now, folks! Although, Long Beach has great ocean beaches, most water sports are done on the beaches on the bay. More often than not, it’s in Alamitos Bay. You can paddle board, after you receive lessons. There’s hydrobikes, where you basically ride a bike on the water, and of course, kayaking, and water skis. Whatever your preference, you’ll find it. However, if you love to surf, Long Beach isn’t going to work out for the surfers out there. Waves never get big enough for surfing, but paddle boarding is pretty cool…. Days go by quickly in Long Beach, and before you know it, you need a little down time at the hotel. When hunting for a hotel in Long Beach, a pool is important, and Hyatt Centric happens to have a rooftop pool. Lounge for a bit, and then gear up to hit restaurants around Long Beach. If you love historic places, The Federal Bar is perfect. It’s got great food, but also is an old bank with a night spot down in the bank’s old vault! If you’re a lover of Greek cuisine, head to George’s Greek, where you’re welcome with a huge hug from the owner, no matter who you are! 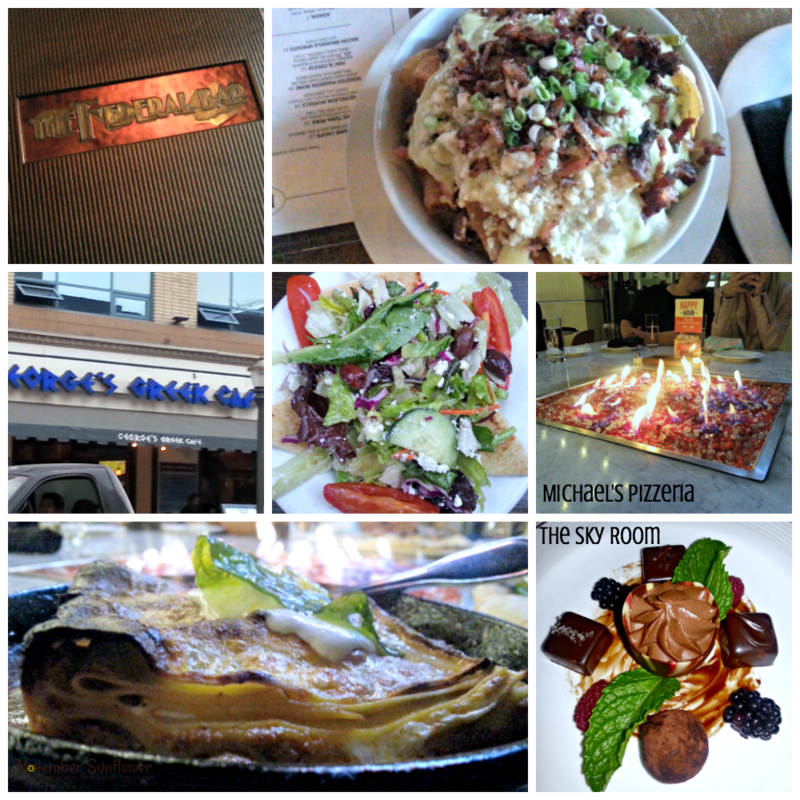 If Italian’s more your thing, ask to reserve the fire pit table at Michael’s Pizzeria, and make sure to order the Lasagna! If you’re hoping for a little upscale, dress up in your little black dress, and high heels, visit Sky Room. The views of Long Beach are gorgeous, and when you head up to the bar upstairs, you can see as far as Los Angeles. On a clear day, I was told you can see the Hollywood sign! After a great night, another morning must start with a delicious breakfast, and locals swear by Breakfast Bar. The line was long, but the service and food is worth the wait! Get the potato pancake. Trust me. Powered up for the day, what’s a visit to a seaside city without a tour of the local aquarium, right? 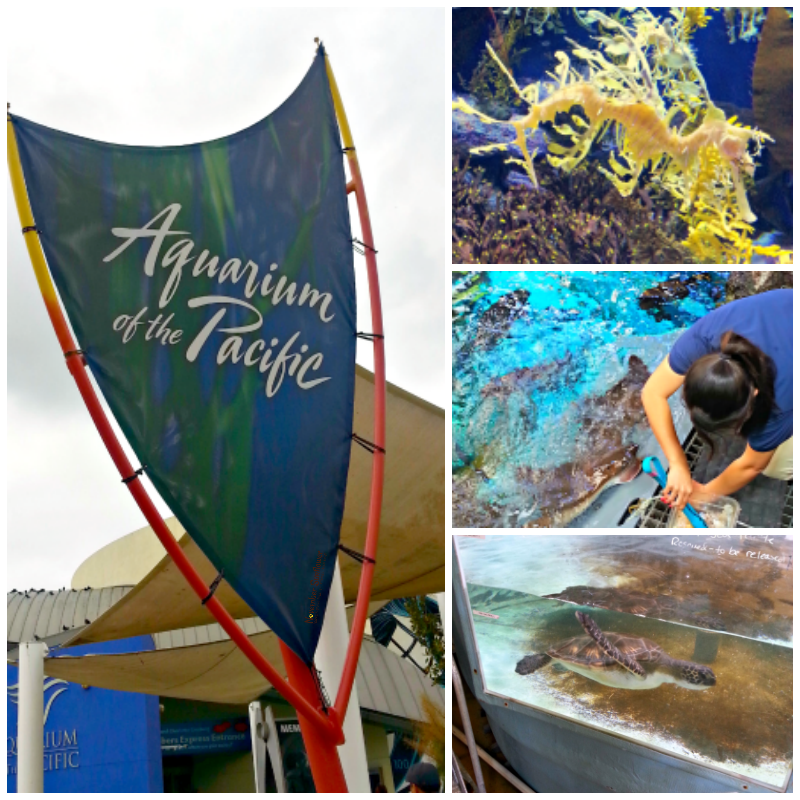 The Aquarium of the Pacific is unique, as it pretty much only has Pacific Ocean life in the aquarium. I was lucky to experience a behind the scenes tour, and got to see all the aquatic life from the back end of the aquarium. Kind of cool, but I missed seeing the new penguins! If you go, make sure to see the baby penguins, from what I hear, they’re adorable. I do believe I got to meet the turtle recently released back into the wild, so that’s pretty cool, right? Art is kind of a running theme in Long Beach. It’s loved by the locals, and many businesses are honored to be chosen to have artists use the sides of their buildings for gorgeous murals for the annual POW! WOW! event, which was founded in Hawaii and has expanded to many cities all over the world. 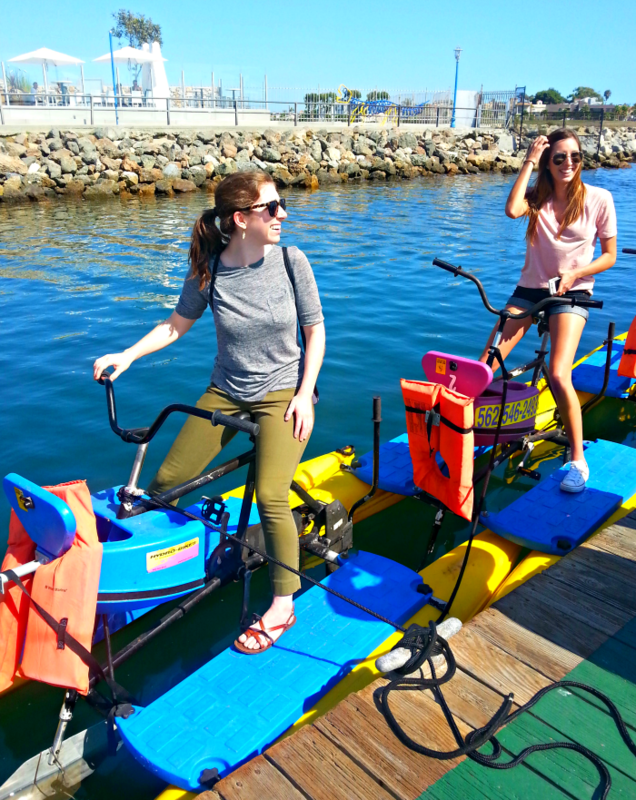 Long Beach is lucky enough to be a part of the festivities, and one of the best parts of a long weekend in Long Beach, is taking a bike tour around Long Beach to check out the many Pow! Wow! Murals. I haven’t ridden a bike since I was probably my daughter’s age, or a little older. I can safely say, you never forget how to ride a bike. However, when riding around Long Beach with more experienced riders, it can be a little scary. However, it was worth the fear, to see gorgeous works of art throughout the city. 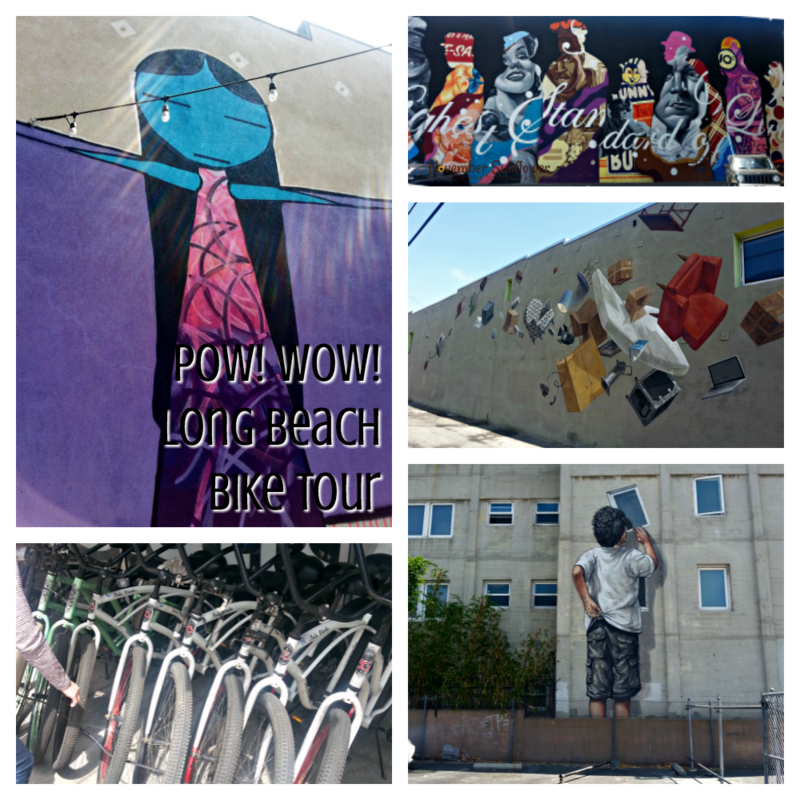 You don’t have to take a bike tour, but definitely check out the murals while driving through, or walking through, the streets of Long Beach. After a bike ride, what’s better than a bit of lunch? 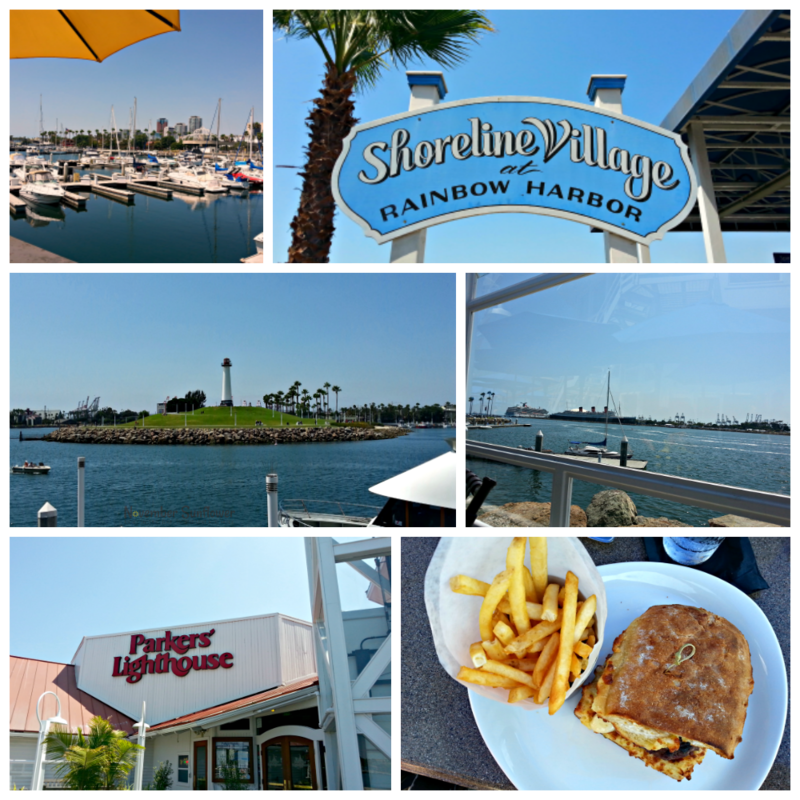 Shoreline Village is the perfect spot to enjoy a little lunch, with more spectacular views of Long Beach. You can’t visit Long Beach without a stop at Parker’s Lighthouse! You haven’t had a burger, until you’ve had one sandwiched between two pieces of cheesy garlic bread, while enjoying a gorgeous breeze, at Parker’s Lighthouse. No joke, people. From what I hear, they do amazing fish, too. I sampled the fried calamari, and if that’s any indication of how the rest of their seafood is done, you’ll be giddy with excitement! Long Beach is a beach town, so it makes sense it hosts beach-centered events. Luckily, at the end of August, Long Beach hosts the World Series of Beach Volleyball right on their very own sandy beaches. People get to check out the action the entire week, and this year, the event took place right on heels of Olympic competitions in Rio! Pretty sweet to see Olympic Bronze Medalists in action! They happened to win in Long Beach, by the way. 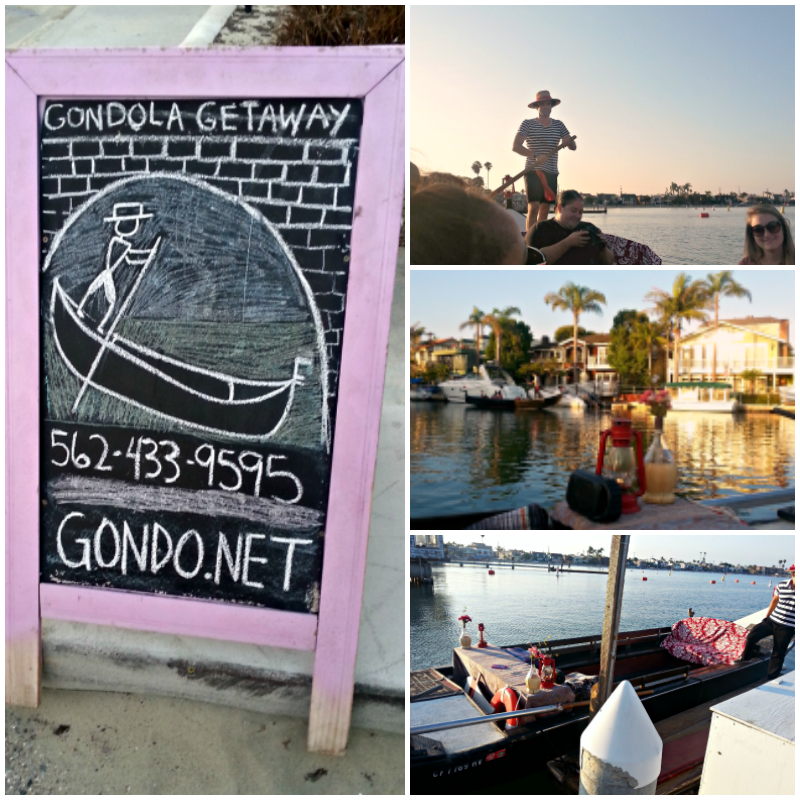 Obviously, if you’re in Long Beach, you think Gondola rides, right? Authentic Venetian Gondola Getaway Cruises on Alamitos Bay and around Naples Island is the only way to enjoy a relaxing evening with friends, or family. Spend an hour enjoying a getaway cruise around the canals, and waterways, of Naples Island. You can bring wine, snacks, and during the ride, you may just get a serenade, or two, from your gondoliers! It’s the perfect way to gear up for an amazing final long weekend dinner at Boathouse on the Bay. Long Beach is a seaside town, so fish is an integral part of almost every restaurant’s menu. 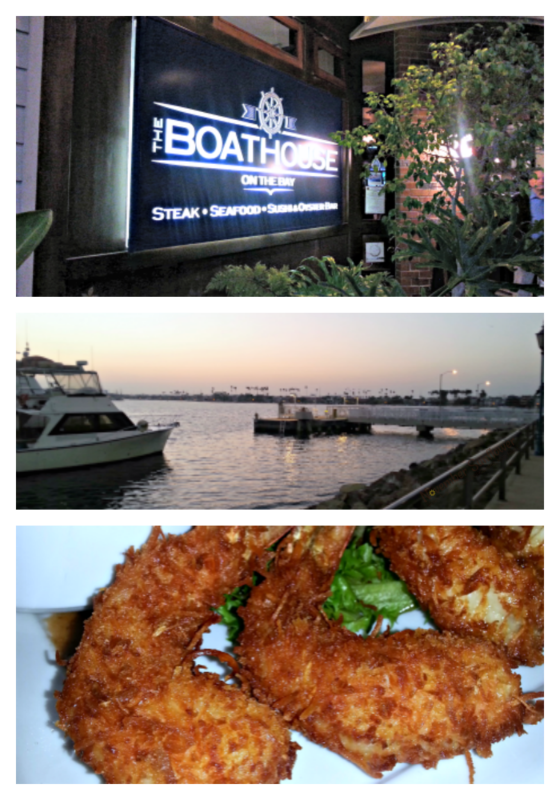 Boathouse on the Bay is all about steak, and of course, fresh seafood. Since a burger was my lunch choice earlier in the day, I figured I’d see what kind of seafood might spark my fancy. Lobster Macaroni and Cheese was the winner for my final meal in Long Beach, and it didn’t disappoint. Huge pieces of lobster baked in the creamiest mac and cheese I’ve ever eaten, was exactly what I needed to cap off an amazing long weekend in Long Beach. Long Beach is close to Los Angeles, but you’d never know you were close to L.A. if you weren’t told how close the big city is to Long Beach. Long Beach offers relaxation for those who enjoy lounging by the pool, with great meals at local restaurants. However, it’s perfect for anyone who wants to experience amazing art, beaches, water sports, and so much more. The weather provides warm days, for lots of fun in the water, and evenings that provide much cooler temperatures, you’ll love to sit by a fire pit at your favorite restaurants on the water. Perfection. 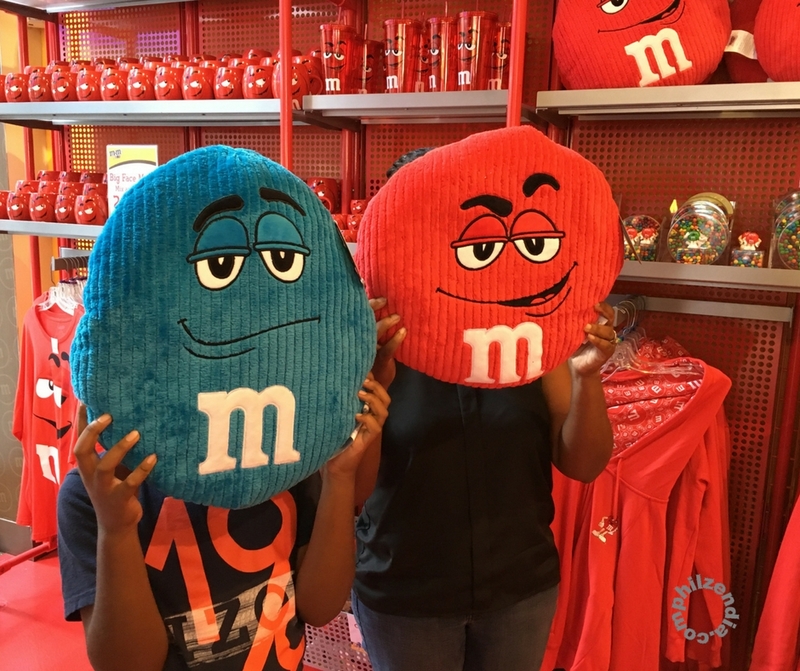 Staci shares her unfiltered opinions about life, travel, shopping, money, family, food and more! She can be found on her own digital publication, NovemberSunflower.com.